Burglars shot Rex several times as the German shepherd tried to protect a 16-year-old teen hiding in his parents' bedroom closet. Javier Mercado ignored the loud banging on his front door by two men he didn’t recognize. But when the 16-year-old saw the pair walk around to the back of his house — and heard the rear sliding glass door shatter seconds later — he realized he was in danger. That’s when the teen’s German shepherd, Rex, jumped up from beside him and ran downstairs. The dog faced off against the intruders in a series of actions that saved Javier’s life but nearly ended his own. On Sunday, following surgery to repair bullet wounds and beatings he sustained from the burglars, Rex was released into the care of an eternally indebted family. “I’m grateful Rex is alive,” said Javier’s mom, Julia Cadena, who noted that her son was on the phone with 911 for nearly an hour before police arrived. Javier, who takes school classes online, was alone last Wednesday when burglars forced their way inside his Des Moines, Washington, home mid-day. He said Rex immediately leaped downstairs to protect his territory. Upstairs, Javier hid inside his parents' bedroom closet, speaking quietly with a 911 operator on his cell phone. He then heard Rex run upstairs and could soon sense him standing right outside the closet door. Police sirens rang out in the background shortly after the last shot fired, prompting the thieves to run off. Javier eventually emerged from the closet to see blood everywhere, including a trail into his own bedroom. “It looked like Rex was still trying to look for me even after he was shot,” he said. Julia said an animal control technician took Rex away before she reached her son, who initially thought his beloved pet died. The family learned a few hours later that Rex was still alive but needed to be transferred to a veterinarian hospital for additional treatment. Rex, who turns 3 in May and has been with the family since he was a puppy, had been shot in the neck and both hind legs. One of the bullets caused a fracture to the tibia, which a surgeon repaired on Friday afternoon. 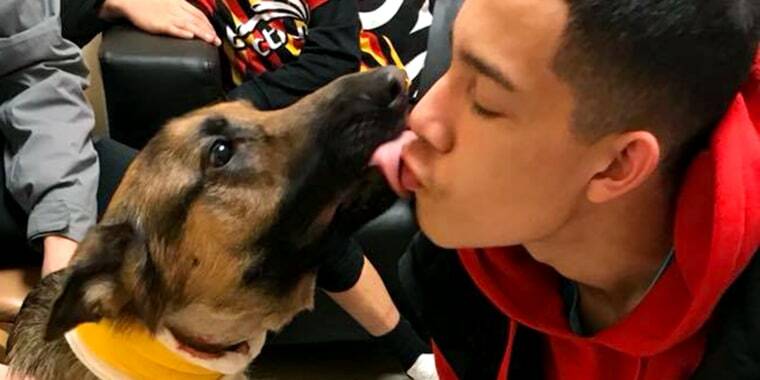 Julia's cousin, Susy Cadena, set up a Gofundme page to help the family handle vet bills and the account quickly reached its $10,000 goal within a day. It has since raised more than $60,000. The family has yet to return to their home, which has shown signs of a second break-in since the initial invasion, and has been staying with relatives until they can move. Rex has been extremely sensitive to noises since the break-in, his family said. He also appears to be more protective of Javier than even before. While his injuries and trauma will require him to have therapy and treatment for arthritis, Rex appears to be recovering as well as can be expected. Javier said he continues to process the emotional week he's had, but said it felt “fantastic” to have his dog back.